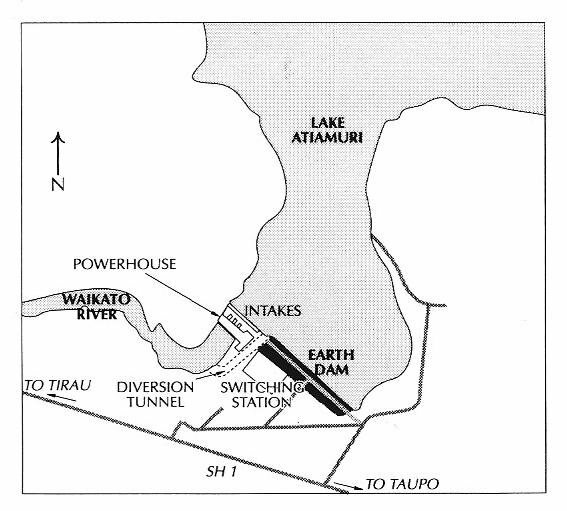 Atiamuri power station was the sixth hydro-electric power station built on the Waikato river below Lake Taupo. In the period after the WW2 there was substantial growth in the demand for electricity and this resulted in supply problems on both islands for two decades. At this time blackouts occurred and the government was under considerable pressure to increase the power supply. Atiamuri continues generating electricity today. Atiamuri Power Station in 1959. Image courtesy Mighty River Power. Karapiro power station marked the start of hydro-electric station construction in the period of power shortage following WW2. It was built largely during the war and commissioned in 1947. 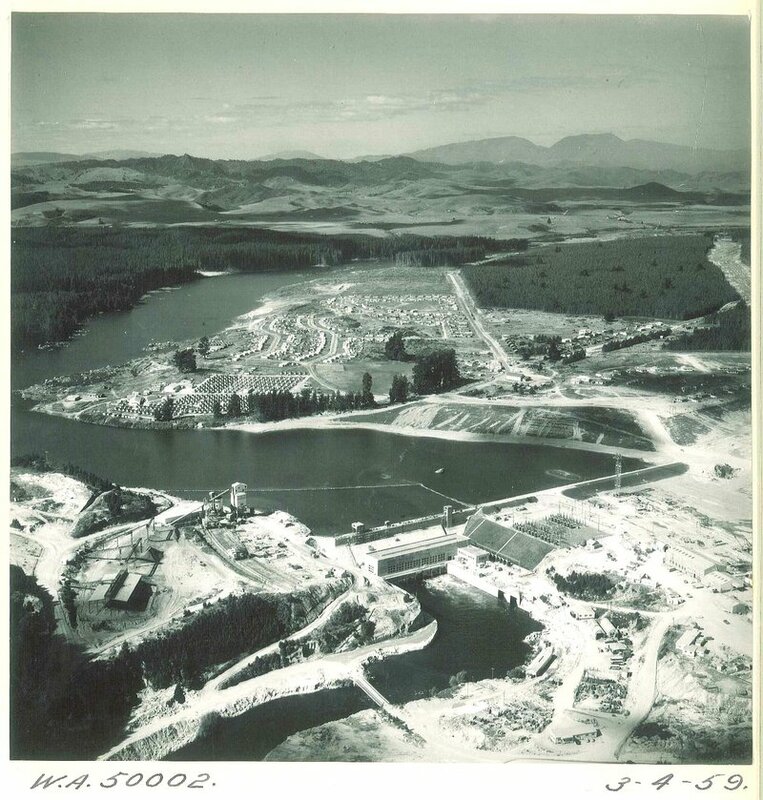 In 1953 Maraetai and Whakamaru power stations were still under construction. Although the former was able to produce limited power at the end of 1952, it was opened in 1953 and reached full capacity in 1954. But with the continued growth in demand, the start on further stations was essential. Because of the limited capacity of the Ministry of Works Power Design section, it seemed clear that the design staff available in New Zealand could not cope with all the Waikato projects at the speed required. A geophysical survey of the Atiamuri site had been undertaken in 1947-48, and by 1950 investigations were complete. In August 1950 Cabinet gave approval in principle for Atiamuri, Ohakuri and Waipapa, the first two to be designed by overseas consultants. Ultimately Ohakuri was designed by the Ministry of Works. Initially, Mr Goosman, Minister of Works in the National Government, also wanted these three schemes to be constructed by overseas contractors. In 1952 the English firm of Sir Alexander Gibb and Partners, in association with another English company, Merz and McLellan, sent out staff to design Atiamuri, which originally was to have only three turbines, a fourth being approved in 1958. The decision to employ consultants caused some consternation amongst Ministry of Works engineers who had just finished designing Whakamaru and were looking for work. When permission to call tenders was sought early in 1953, Treasury baulked and sought deferral of the project for at least a year. However this would have increased the risk of shortages later in the decade, and the government gave its approval in September 1953. Construction work began immediately. The site and a considerable area of pine forest were cleared, a camp was erected and access roading and a new high-level bridge across the Waikato were constructed. The main highway was realigned and a road was built to Whakamaru to make a link with Mangakino. The camp in Mangakino comprised more than 350 single men's huts, 100 married men's houses, and 30 houses for salaried staff. It had a cinema, a 'dry' canteen, a library and a recreation room. Atiamuri Power Station Site Plan. Image from Martin p. 162 courtesy Ministry of Culture and Heritage. Twin diversion culverts about 137 meters (m) long were completed by the end of 1956, and the river was diverted into them in January 1957. One culvert was subsequently converted into a high-level spillway, while the other was closed. The river was quickly blocked with large boulders and gabions, providing a coffer dam within which excavations could proceed. The foundations, as with some of the other Waikato stations, were once again of crucial importance. Only part of the dam could rest on a dome of very hard rhyolite rock which, when strengthened by the inevitable grouting, would support a concrete gravity structure. The remainder of the structure was to comprise an earth dam, and finding a secure foundation for this proved difficult. Excavation for the concrete section went approximately 12 m below the original river bottom and the foundation work in an old riverbed for the earth dam was complex. It required an open cut of an average depth of 60 feet down to the ground-water level and the shifting of around 300,000 cubic yards of porous gravels, with a watertight concrete cut-off wall extending down through the sand, gravels and boulders to be keyed into firm pumice breccia. Curtain grouting continued for 30 feet below the foot of the cut-off wall. The considerable drainage problems were dealt with by extensive drives and shafts. Meanwhile the powerhouse was constructed in the gorge just below the dam. The first machine was commissioned on 17 November 1958, around six months ahead of schedule, the second in early December and the third early the following year. A fourth unit was installed in 1962. With Meremere having been commissioned at much the same time and heavy rainfall in the Waikato and Waikaremoana catchments, the post-war restrictions on electricity use in the North Island were at last lifted by Christmas 1958. The power planners were given some respite but knew that the development of the Waikato had to continue if the inexorably expanding demand was to be met. Atiamuri Power Station is the third of eight hydro-electric stations on the Waikato River in the North Island. The station can easily be seen from State Highway 1 between Taupo and Tokoroa. The power station is part of Mercury’s electricity generating infrastructure. There is no public access.